A Tampa group has filed dozens of last-minute voter challenges, in a troubling indication of ramped up suppression efforts. 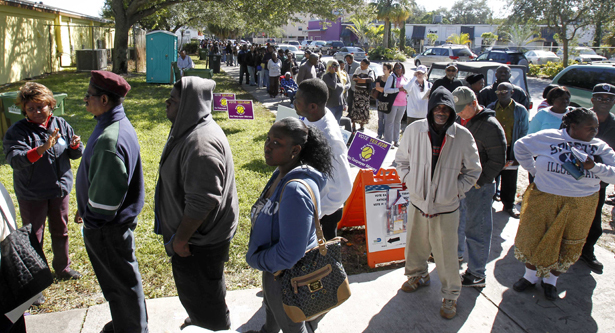 Meanwhile, as record turnout forced long lines, poll watchers have cried foul over bottled water. Tea Party activists in Florida’s largely black and electorally significant Interstate 4 corridor have worked furiously to put a damper on what has been a record-setting turnout thus far. In one of the most striking examples of voter suppression to emerge, Voting Rights Watch obtained a list of several dozen Hillsborough County voters who will be surprised to learn they cannot vote regular ballots thanks to last-minute challenges filed against them. I’ve requested similar information from Miami-Dade, Orange, Pinellas and Seminole counties, but officials have not responded. A spokesperson for the Secretary of State’s Office, Chris Cate, said the state does not track voter challenges, so there is no way of knowing how widespread these sorts of challenges may be. Kelley’s new list is significant in that it is an official under-oath declaration from Tampa Vote Fair that these people should not be allowed to vote. Kelley is putting herself at risk by filing the challenges. If any of the challenges are determined to be frivolous, then Kelley could be charged with a first-degree misdemeanor, punishable by up to a year in prison, for each bogus challenge. The attorney general will make the determination of whether the challenges are frivolous or in good faith, but this is unchartered territory—perhaps the most extreme steps a True the Vote–affiliated group has taken to strip voters of election rights. Hillsborough County managing attorney Mary Helen Farris told me she is not aware of any voter challenges filed in 2008 or 2010. Many states originally enacted challenger laws to block minority voters’ access to the polls. Virginia, for instance, passed its first challenger law in the immediate wake of Reconstruction alongside a host of other suppressive measures, such as poll taxes and literacy tests, aimed at recently freed former slaves. Other states—like Florida, Ohio and Minnesota—similarly passed challenger legislation during the nineteenth century to suppress turnout in black communities. The Brennan Center recommends that challengers bear the burden of proving a voter is ineligible through documented evidence before a legal challenge can be placed, while giving the presumption of eligibility—the presumption of innocence—to a voter. Brennan also recommends that voters should be shielded from frivolous challenges and given ample time to respond to a challenge before Election Day, as opposed to showing up at the polls and finding out that they can’t file a regular ballot. Kelley’s challenges aren’t the only ones Tampa voters needed to worry about during the early voting period. Last Friday and Saturday, the last two official days of early voting, black voters and NAACP members were upset when Republican poll watchers challenged NAACP members for passing out water and offering chairs to voters standing in long lines in the hot sun. Black voters have been turning out in record numbers, not only in Tampa but throughout the state. There are reports of people standing in line up to seven hours, many of them elderly and disabled—and at one Orlando site there was a bomb scare. So NAACP members have been passing out water to help people deal with the heat. A Republican poll watcher reported this activity at the C. Blythe Andrews Jr. polling site in Tampa, a predominantly African-American district, and had the poll clerk stop the water distribution. According to NAACP political action chair Yvette Lewis, the Republican poll watcher accused the teams of bribing voters with the water, much like a challenge filed by a Republican poll watcher Sunday when helpers passed out fried fish. Poll watcher Eve Rockford said members of the left-wing so-called civil rights group appeared at the early polling place wearing NAACP-labeled clothing and 50 cases of bottled water. The activists handed out the water bottles to individuals standing in line waiting to vote. They were also “stirring the crowd” and “talking to voters about flying to Ohio to promote President Barack Obama,” said Rockford, who was trained in poll-watching by True the Vote, a prominent electoral integrity organization. But it didn’t seem to stop the flow of voter traffic. Black voter turnout at predominantly black districts hovered around 45 percent, which Lewis said was “very good” compared to 2008. But it also means that there‘s roughly half of remaining black eligible voters who have one more day to vote, tomorrow, which means lines could be even longer. The early voting number totals are impressive—166,937 in total throughout Hillsborough County, the anchor of the important Interstate 4 corridor that includes Tampa, Orlando and Daytona Beach. In 2008, the total early voting numbers in Hillsborough County totalled 146,563—and that was with four more days of early voting than this year. Ohio officials are also trying a last-minute voter suppression effort. Ari Berman reports.